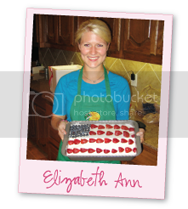 Elizabeth Ann's Recipe Box: My Christmas Eve. . .
5 My Christmas Eve. . .
On Sunday, I ran into Buc-ees to take a "pit stop" while on the road to San Antonio and Nate waited for me in the car. And today, I went to lunch with some friend's and got my nails done. Why do I remember each one of these events so vividly? One reason is because every time I leave the car I tell myself, "For God hath not given us the spirit of fear; but of power, and of love, and of a sound mind" (2 Tim1:7) Another reason is that these are the only times Nate hasn't been by my side since Christmas Eve. On Christmas Eve, I needed one more cake pan, a pie shell and wanted to pick up a Christmas card for Nate. . . so that morning, around 10:30ish, I ran to Randall's. I rushed into the store, headed for the baking aisle, grabbed a cake pan, raced to get a pie shell and then quickly picked out a card for Nate . . . this all literally took 2 minutes max. . . I rounded the corner of the aisle on a mission to go check out QUICKLY and heard some shouting. . . I paused, thinking there was something unusual going on. . . then I saw a guy drop to the ground and motion me to run. . . I turned on my heels and ran to the back of the store, telling the people I passed that there was someone harmful at the front of the store and that we needed to get back . . . I was in the back corner of the store with about 15 other people when I heard a rifle shot. . . My mind was racing thinking either that someone wanted to rob everyone or my other thought was that there was a mental person wanting to die on Christmas Eve and take others out with him. . . I turned to an employee and asked where could we hide. . . no response. . . everyone around me was in shock. Since we were "sitting ducks" at the back of the store, I knew that there was some place that Randall's stocked the milk behind the aisle we were on . . . so I followed the aisle in front of the milk until I got to the swinging doors that led to the "warehouse" part of the store. . . people started following me and we ended up at the back of the store where the trucks unload. . . we were all about to run out the back door when an employee said she just saw two men jump over the fence right in front of the door we were about to escape from. . . so, we stayed in the store. . .I didn't know if those were the gunmen or if those were just people trying to escape from the gunmen. My mind was racing and I had multiple plans. I kept thinking the gunman was going to come through those swinging doors and either rob us or shoot us all . . . I was going to either run out the back door, hide in the service elevator, hide behind the flats of grocery items, or last case scenario hide in the basement . . . but in the back of my mind, I was thinking there might be a hostage situation if the gunmen were caught in the store and the police were surrounding them and I didn't want to be "trapped" in the basement if it got to that point . . . so, I really wanted to just run out the back door and hope they didn't shoot me in the back.. . . there were about a dozen people hiding in the back with me including one dad with a girl probably in third grade, and one mom with a little boy who was around three. . . almost all the women were crying and the little girl was terrified. . .I was trying to keep my wits about me and I didn't have time to think about crying with all of the different thoughts that were going through my head. I would say a minute after we got into the "warehouse" we heard police helicopters . . . and about 10 minutes later, 6 police cars came racing to the back of the store, guns drawn, to look at a car we hadn't even noticed and to look over the fence the guys had jumped over. . . needless to say, the event was over. . . . . . I went home and told Nate what happened . . . Saying he was mad is an understatement . . . Luckily, no one was hurt. . . luckily, the men just robbed the bank at the front of the store, took the money and left. . . but, what if. . .the most terrifying part about the whole situation was hiding from someone willing to shoot a rifle in a crowded grocery store on Christmas Eve and not know where they were, what they wanted, and thinking they were going to come through the doors any minute . . .
Chills and tears.. OMGosh! That is so incredibely scary! You have lots of angels around you, glad you had a merry Christmas! Love you! Oh gracious Elizabeth - I can't believe you went through this on Christmas Eve, or at all for that matter! So glad you are safe and unharmed. OMG! I can't believe this happened to you and am so thankful you are safe! Oh my gosh, this is crazy!!! So glad you are ok and it totally puts things in perspective of what's important on Christmas Eve! Scary!